Hi and welcome to PowerPoint Speak Easies Volume 2! PowerPoint Speak Easies Volume #2 are a high-quality collection of animated "talking" characters that you add to your PowerPoint videos so they "talk" to your viewers. Speak Easies are like having your own army of spokes people at your every whim. Just add a Speak Easy to a PowerPoint slide with your audio voice over and BAM! You have a video that talks to your viewers! 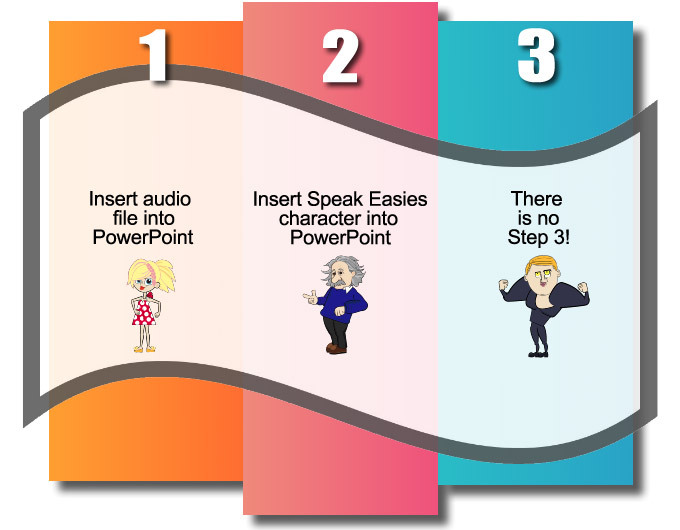 Important Note: The demo video above uses characers from Speak Easies #1 that are not included in this Speak Easies Volume #2, but it should give you some great ideas for using Volume #2 in your PowerPoint videos. There's 26 high quality characters. And they come in both animated and still image versions, each in 3 different poses. That's a total of 156 images. PowerPoint Speak Easies Volume #2 are very inexpensive and a great value for any and all video marketers. PowerPoint Videos Talk is Easy! Here's a quick one minute video that shows how easy it is to add an audio voice over to PowerPoint and have Speak Easies #2 "speak" to your audience. Important Note: The demo video above uses characers from Speak Easies #1 that are not included in this Speak Easies Volume #2. Of course, there's some other cool stuff you can do with Speak Easies using very simple PowerPoint techniques...I'll show you how in the included training. your Speak Easies Volume #2. Speak Easies are so big, it's impractical for me to add them all to a web page, which is why I added them to the videos above instead. However, this extra large size means you can scale them up and down in PowerPoint as needed, and still maintain the highest quality for your video creations. Sure, the size means they take a few extra minutes to download, but the extra quality is more than worth it. After all, you only download them once, but you will use them forever! or end this offer at any time. PowerPoint. PowerPoint has a free 30 day trial, plus it's only $10 a month after the trial ends so you can make money BEFORE you pay money.